What a relief! 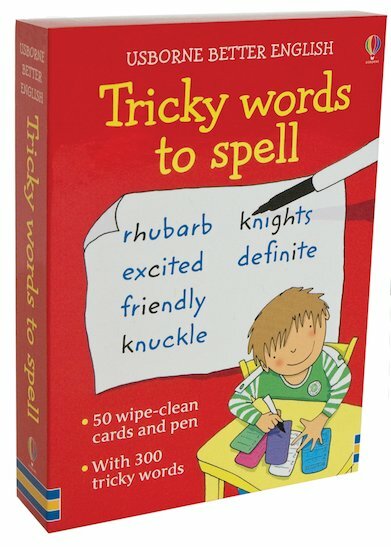 A box of support for those tricky words that we all need a helping hand with! Practise 300 difficult and non-phonetic words on fill-in flashcards which wipe clean after use. From almond to separate and precious, these unique and colourful cards let children have fun writing out words they commonly stumble over, wiping the cards clean after use so they can be accessed again and again. Each double-sided card features three tricky words grouped according to a shared characteristic – e.g. receive, deceive, ceiling – letting children practise several examples of each different spelling rule, while also building vocabulary. Perfect for home learning, this pack contains fifty cards, a wipe-clean pen and helpful spelling tips.